General View of the top half of the back of Meigle no.4, an upright cross slab. Full slab is 5' by 2'11'' wide and 6'' thick. 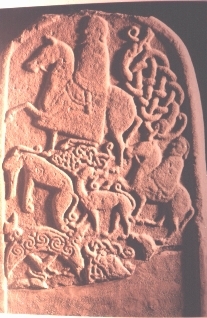 This shows the top half of the back of Meigle no.4, an upright cross slab. The slab has been broken in two. At the top there is a horseman armed with a sword and spear. To his right there are a pair of serpentine creatures placed symmetrically, and facing in opposite directions. Below this there is an elephant, on the left, and below that crescent and V-shaped rod symbols. To the right of the elephant there is a beast biting the end of the tail of a serpent whose body is interlaced with the crest of ear of the beast. To the rigth of this there is a second, smaller, horseman armed with a sword, riding behind the first one.